Puma Golf is fusing the worlds of Golf, Fashion and Technology together in their newly released iPhone and iPad app – Puma StyleCaddie. 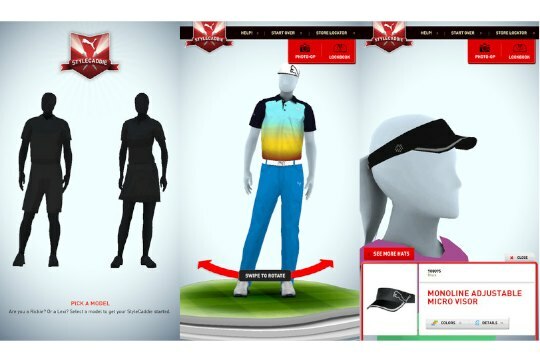 The app is a virtual dressing room that contains all of the key apparel, footwear and accessories that Puma Golf offers allowing consumers to mix and match anything they want to create their own one-of-a-kind golf look. Puma StyleCaddie, a truly revolutionary fashion app, lets users select a male or female silhouette to dress. From there, the user can select from a wide assortment of shirts, bottoms, shoes and accessories, changing the styles as often as wanted until they have assembled their masterpiece. The silhouette can be rotated so the outfit is viewable at almost any angle, and don’t be surprised if the silhouette celebrates your work with a guitar riff in true Puma Golf fashion. Users can also start by using the ‘Lookbook’ tab in the upper right hand corner. This gives users pre-built looks that Rickie Fowler, Jonas Blixt, Lexi Thompson, Blair O’Neal and other Puma Golf athletes will be wearing on Tour. Users can build the same exact look as their favourite Puma Golfer or use the pre-built looks to generate new ideas for their own outfits.